You have to love a cooked vegetable that’s also dessert. 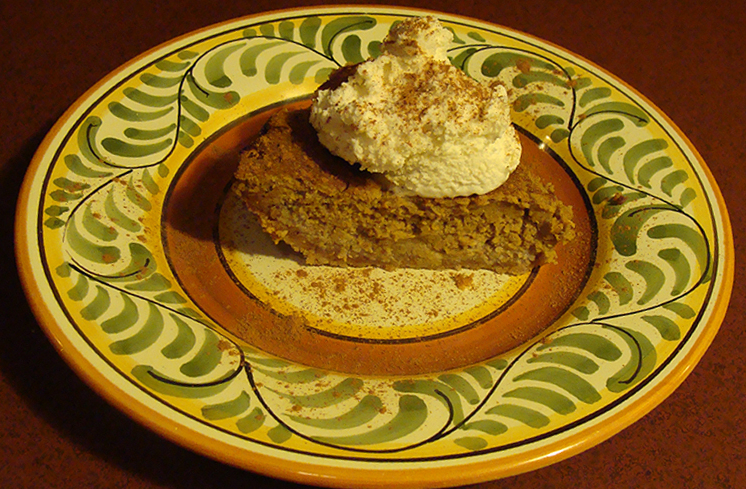 How about pumpkin pie for the holidays? It doesn’t have to be something made with toxic ingredients like wheat flour and refined sugar. And it doesn’t have to be difficult either. Start out with the standard almond pie crust mentioned elsewhere here on Hardscrabble Times. It’s basically 1.5 cups almonds pulverized to flour in a Cuisinart along with a half-stick melted butter. Press into a pie pan and blind bake for a few minutes to set the crust. For the filling, fire up the Cuisinart again (I don’t even wash it after making the crust) with 2 cups roasted pumpkin, 4 eggs, 1/3 cup honey and 1/4 cup heavy cream, plus 1 teaspoon cinnamon, and 1/2 teaspoon each of nutmeg and clove. Pour into the crust and bake at 350 degrees for about 45 minutes. This pie is not very sweet, so a little whipped cream topping makes it great. I make mine with honey and a little vanilla. This entry was posted on December 7, 2009 at 11:45 pm and is filed under Real food nutrition. You can follow any responses to this entry through the RSS 2.0 feed. You can leave a response, or trackback from your own site. I would add a bit of ginger to your recipe, too. I think you will like it.
. . . and, by the way, the best deal I’ve found on almonds is at Vitamin Cottage, where I also noticed the last time I was in there that they still have baking pumpkins. I use raw almonds. Melt the butter in a saucepan. Put the almonds in the food processor and grind them until they are as close to flour as possible. You may need to stop and scrape some of the almond flour out of the corner and off the sides. Anyway, when ready, and with the machine running, drizzle the melted butter into the ground almonds. Soon it will form a ball like regular old dough. I usually let it go a while longer to get a smoother texture. Then just press it into a pie pan. Bake it about 15 minutes to set, then fill it with whatever. Actually my favorite was the apple-berry. That sounds yummy Hal, I have all the ingredients to try it. Here’s a recipe your family might enjoy. My kids love them. I usually cut the rapadura in half and they taste just as nice. They should be about 1/2″ thick. Sometimes they go flat on me…..haven’t figured out why. Place almonds in food processor and process to a fine meal. Add remaining ingredients and process until well blended. Form dough into walnut-sized balls and place on butered cookie sheets. Bake at 300 for about 20 minutes. After 5 minutes in the oven press cookies down lightly with a fork. Let cool completely before removing to an airtight container. Store in refrigerator.